Aerial photograph of Eye Airfield, looking north, 16 July 1943 while still under construction . Photograph taken by 7th Photographic Reconnaissance Group, oriented north. 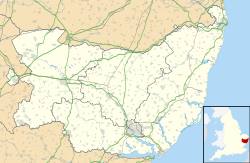 Royal Air Force Eye or more simply RAF Eye is a former Royal Air Force station located 11 miles (18 km) northeast of Stowmarket, Suffolk, England on the northwest edge of Eye and south of Diss. Eye was a standard Class A airfield for heavy bombers. The U.S. Army 829th Engineer Battalion began construction of this WWII air base in September 1942, with the 827th Battalion arriving that December to assist. The 859th Battalion arrived in May of the following year when the 829th Battalion left. The bulk of the work was done in the summer of 1943 with the 827th setting records in pouring concrete while the 859th made their mark in building construction. Additional work was performed by British contractors. The airfield was declared operational and turned over to the U.S. Army Air Forces on 7 December 1943, two years after the attack on Pearl Harbor. On 1 April 1944, the entire airfield was complete and occupied by the 8th Air Force, which designated it AAF Station 134. RAF Eye was one of the last wartime airfields to be built in the area and some of the equipment used in its construction remained for many years after the war. Ground personnel of the 490th Bomb Group work on a B-24 Liberator (serial number 42-94837 ) nicknamed "The Jinx 13" at Eye. Boeing B-17G-85-BO Fortress Serial No. 43-38400 "Alice Blue Gown" of the 851st Bomb Squadron. This aircraft completed 67 missions. The airfield was opened on 1 May 1944 and was used by the United States Army Air Forces Eighth Air Force 490th Bombardment Group (Heavy). The 490th arrived from Mountain Home AAF Idaho and was assigned to the 93d Combat Bombardment Wing. The group flew Boeing B-17 Flying Fortresses and Consolidated B-24 Liberators as part of the Eighth Air Force's strategic bombing campaign. The group tail code was initially a "Square-T" when it moved in with B-24 Liberators. After being re-equipped with B-17G Flying Fortresses, it adopted a red stripe at the top of the plane's vertical stabilizers. The 490th BG combat in June 1944 with B-24's, bombing airfields and coastal defences in France immediately preceding and during the invasion of Normandy. Then struck bridges, rail lines, vehicles, road junctions, and troop concentrations in France. Supported ground forces near Caen in July and near Brest in September 1944. The group converted to B-17's in October and operated primarily against strategic targets until the end of February 1945. The 490th mounted attacks against enemy oil plants, tank factories, marshalling yards, aircraft plants, and airfields in such cities as Berlin, Hamburg, Merseburg, Münster, Kassel, Hannover, and Cologne. Interrupted strategic missions to attack supply lines and military installations during the Battle of the Bulge, December 1944-January 1945. Beginning in March 1945, attacked interdictory targets and supported advancing ground forces. After V-E Day, carried food to flood stricken areas of the Netherlands and transported French, Spanish, and Belgian prisoners of war from Austria to Allied centers. The 490th returned to the USA to Drew Field, Florida on 3 September 1945, then was inactivated on 7 November 1945. After the war Eye then transferred to RAF Bomber Command on 1 November 1945 as an active station. However the airfield was gradually run down and was finally sold by the Air Ministry during 1962-63. With the end of military control, Eye airfield was converted into an industrial estate with a large factory for processing straw being established in the hangars and former technical site. Later, other industrial development and new buildings were built in the same area. There is a natural gas pumping station in the centre of the former airfield. The world's first poultry litter-fueled generating plant was built on the site in 1992. It produces 12.7 MW of power and consumes 140,000 tonnes of chicken litter a year, as well as a proportion of horse bedding and feathers, and is owned by Energy Power Resources (EPR). Many of the old taxiways and runways remain, along with a T-2 hangar and various wartime buildings in various states of repair and use. A memorial dedicated to those who served with the 490th Bombardment Group during World War II was unveiled on 29 May 2016. ^ "Eye". American Air Museum in Britain. Retrieved 7 Mar 2015. ^ Murphy, Rebecca (29 May 2016). "War memorial honours US servicemen who served at Eye Airfield during Second World War". DissMercury. Retrieved 2017-09-28. Wikimedia Commons has media related to RAF Eye.